Here’s some compelling evidence in support of all you supplement users out there: you’re more likely to be healthy. In fact, according to U.S. researchers, if you regularly take supplements, you’re more likely to report very good or excellent health, have health insurance, use alcohol moderately, avoid cigarette smoking, and exercise more frequently than nonusers. Dietary supplements are used by more than half of adults, although the reasons motivating this use have not been previously examined across the nation—until now. U.S. researchers just completed a study in which they analyzed people’s motivations for taking dietary supplements. They then reported on the types of products used and examined the role of physicians and health care practitioners in guiding choices about dietary supplements. There you have it—a snapshot of the average supplement user’s lifestyle, and it seems to be a pretty healthy one. 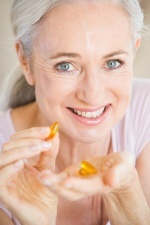 While the study doesn’t specifically say if supplement use does indeed boost bone health, or joint health, or eye health, it does seem to suggest that the overall health of supplement users seems to be pretty high. It could be that taking supplements have health benefits over and above the specific reasons for which they are being taken. Talk to your health care provider if you would like to add some supplements to your weekly nutritional intake. Bailey, R.L., et al., “Why US Adults Use Dietary Supplements,” JAMA Intern Med. February 4, 2013: 1–7.